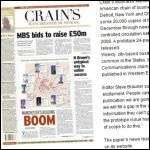 I KNOW people from both a PR and freelance perspective are keen to see Crain's Manchester Business magazine succeed for various reasons. And there has been some interesting articles and reports across a number of sites in recent days. Entrepreneur and supporter of north west start-up businesses Manoj Ranaweera writes up a post about a meeting he had with the magazine's editor Steve Brauner. How-Do looks at plans for a soft launch of the title in December and a bit of a round up of names with editorial responsibilities. Quick piece from Press Gazette giving a little background into the company. SHANE Richmond of the Telegraph.co.uk has a good go at a recent article in the NUJ's Journalist magazine about the impact the internet and digital convergence is having on the work of journalists. He says the NUJ has a blinkered approach to online, and when you read through his piece you can see how the union seems to be trying to prevent change instead of equipping its members to embrace it. The danger is that whilst fiddling with agreements and procedures, quicker more agile competitors move in on newspapers and other publications pulling the rug from beneath them, and ultimately chipping away at the NUJ's own membership. TWO very interesting articles on Mashable today, the first of which looks at how both Twitter and Google Maps has been used to tell the story of the fires sweeping California. Titled This disaster will be Twitterized it features example of how people have been logging details of the course of the fires, and because there are restrictions on the number of characters which can be used, and space on the maps, the matter of fact display of numbers of homes burnt and people being evacuated is quite chilling. And the second piece is about how to promote online video stories through YouTube, and other services, and is called YouTube ain’t screwed, which highlights the importance of getting your "stuff" out there so it has a better chance of landing in front of an audience. IF you have responsibility for messages on a forum, and I would imagine this applies to comments on a blog as well, then check out The Guardian's report on two recent court cases where the details of anonymous users were released via the courts. The cases relate to the use of message boards on both a site for fans of Sheffield Wednesday Football Club and Sunderland property firm Pallion Housing, where posts were targeted at a rival housing organisation. IT has been a bit of a busy week so I've not had much chance to point out some of the interesting items I've crossed out on the internet. Linda's book is now on the bookshelves of shops across the UK, and we've highlighted some of the recent reviews in the right hand column of the Freelance Writing Tips website (also win a writer's goody bag). Some simple steps you can line up and tick off for the simplest of websites to ensure it works effectively for you. I SPOKE at the latest Digital Editors' Network which met in Preston yesterday and gave people an opportunity to share ideas on a variety of subjects concerning online publishing. There was a very useful presentation by Andy Dickinson on the use of video in newspapers, offering advice on the best pieces of kit to use but also ways to draw audio and photographs together, as well as potential revenue streams such as featuring local businesses in video advertisements. Rounding off the afternoon was the network's main organiser Nick Turner, head of digital content for CN Group, who highlighted what had appealed to readers on his own sites. The mediocre record companies, mediocre A&R guys and the mediocre acts are struggling to stay in place. They're nervous that it all might fall apart. So they wait. I WOULD have hoped that by now most people would know a few of the essential features that need to be included on a blog for it to be called a blog. I was reading the Mancubist website, who mentioned that Manchester Council leader Sir Richard Leese had set up a blog. Called The Leader's Blog, not very touchy feely that, it goes from bad to worse with no RSS feed, although hiding in the footer is reference to the council's press release RSS feed. A COUPLE of days ago the winners of the Manchester Blog Awards were announced at Matt and Phred's jazz club. There were readings, much talk and conversation as well as a little music late on in the evening, which nicely rounded off the night. One of the judges, the BBC's Richard Fair, has written up an entertaining piece about the evening. ONE of the key benefits of using a blog to help promote your business is the fact it lets you comment on changes in legislation, or similar, that are making the news. Mark Simpson of accountancy firm Simpson Burgess Nash has done just that following the pre-Budget report by Alistair Darling earlier this week. I helped the company with setting up a TypePad account, but Mark has used the blog very effectively to write a piece almost straight after the end of the Chancellor's speech on his first impressions. But also in the past day or so, he has put forward his thoughts on inheritance tax, capital gains tax and is scathing of the changes being introduced for non-doms living in the UK. The speed with which you can comment to both readers, and those within the company, via a blog can't be beat.